Mardi Gras Fever (SlotGame) was released on 5th February 2007 by Microgaming. The game has 5 reels and 20 paylines. The game comes with a Mardi Gras theme. Mardi Gras is yearly festival in New-Orleans. 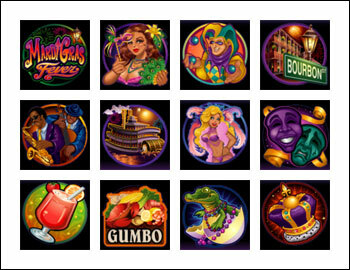 The graphics of the game are bright, colorful theme oriented and the symbols on the reels include Bourbon Street, jester, mardi gras lady, crown, jazz band, baby alligator, cocktail etc. In the background the game has smooth jazzy sound effects, which loops. The highlight of the game is the Mardi Gras Bonus Feature. This Mardi Gras Themed slot game has 5 reels and 20 paylines. The coin size varies in the denominations of 0.01 up to 0.50 per pay line, and wager 1 up to 10 coins per payline bet. The minimum bet amount is 0.01 and the maximum bet amount is 100.00 per spin. The maximum jackpot payout of the game is 2,000 coins per line bet. The game features two Scatter symbols, a Mardi Gras Bonus Feature, and a Free Spins Bonus Round game with 10x time's multiplier value for all winning combinations. The Scatter Symbols are the Jester Clown and Bourbon Street symbols. The Bourbon Street, and/or Jester scatter symbols can be scattered anywhere on the five reels to complete winning combinations, provided three or more Bourbon Street, and/or Jester scatter symbols appear. Three or more Jester Clown symbols activate Free Spins while three or more Bourbon Street symbols activate the Mardi Gras Bonus feature. 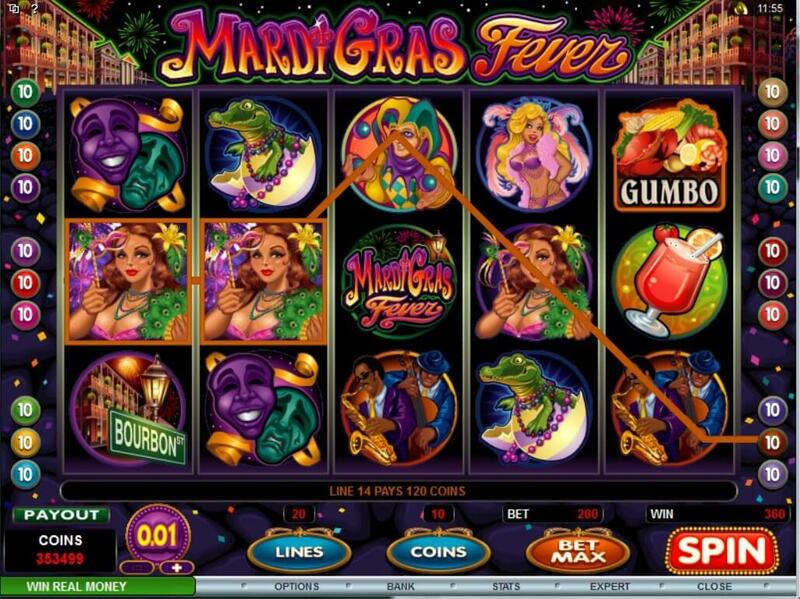 Three or more Bourbon Street scatter symbols scattered anywhere on the five reels in the Mardi Gras Fever video slot machine game activates the Mardi Gras Bonus Feature game. This feature is played in a new window with 12 shuttered windows on a building. Player has to choose 3 of the 12 shuttered windows. A Prize will be awarded under each selected shuttered window. Three or more Jester scatter symbols scattered anywhere on the five reels in the game activates the Free Spin Bonus Round game. Player is awarded 5 Free Spins and the wins are multiplied by 10x. The feature cannot be re-triggered during the free spin round. Mardi Gras is an New-Orleans tradition, like a street festival. Mardi Gras is celebrated for three days in Argentine cities of subtropical northeast and it begins on Sunday and ends on Tuesday. Payout on enabled lines only.